There are plenty of brands that borrow vintage designs as starting points, but not everyone gets it right. Some of the best T-shirt designs weren't retro brands as much as band art growing out of the synergy that was the Sixties. The colors were vivid. The letters were drawn by hand. The imagery was all over the place, ranging from straightforward to psychedelic. Everything being made at the time truly dressed the stage. It was art created by artists who relied on pot as much as pens to ink out handbills, posters, and T-shirts. Almost everybody was breaking the rules, shaping the new look of counterculture but never taking it all that seriously. Most them were simply happy being set free by promotors like Bill Graham and Chet Helms for bands on the verge of becoming household names. Pop Art, Op Art, And Art Nouveau straight from Wolfgang's Vault. The posters are cool, but there was something to be said for the timelessness of the tees. The Jimi Hendrix by artist David Byrd captures the free spirited excitement of the time. 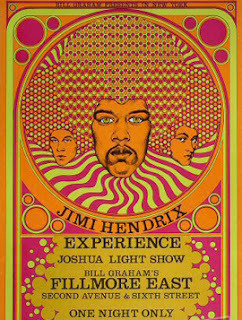 As the story goes, Hendrix loved the design so much that the poster art became the cover of his press kit. When Hendrix did play the legendary Fillmore East, he was already at the height of his career. He was booked for two shows on one night, with the opening act being Sly & the Family Stone. And according to the T-shirt brief, Sly wasn't mentioned on the promotional material and was even heckled by the crowd who had only come in for the legendary Hendrix. Like all of Wolfgang's Vault vintage T-shirts, they are made from ringspun cotton, with a few featuring a polyester blend to add some stretch and softness. All of the shirts are cut to fit like they did in the 60s, 70s, an 80s, which is more snug than many shirts made today (Wolfgang suggests one size up). Not all the shirts on hand were originated by artists designing promo material for bands slated to play the Fillmore. Some of them are licensed with partners, like the infamous Ramones logo that first appeared in the late 1970s. The run of the logo dates from 1978-1983 and has become one of the best recognized icons of punk. Although the store doesn't include the artist, we know the man behind the now vintage image was artist and designer Arturo Vega. It was Vega's loft, which was located just a few doors down from CBGBs, where the Ramones found their makeshift headquarters in the early years. Vega has even been called their muse. Originally, the artist was just trying to find ways to cover his own airfare and expenses so he could join the band on tour. That's when he came up with the idea of designing a T-shirt. The band laughed at him out loud. They never expected them to sell. Another licensed design is the equally famous Roxy Music girls photo, featuring Constanze Karoli and Eveline Grunwald (sister and girlfriend of guitarist Michael Karoli). The shot was taken for an Island Records promo for Country Life in 1972. Even people who didn't click with the music, clicked with the snapshot of two girls standing in front of a shrub. If you ever wondered, the cover was shot in Portugal, with the art credited to Bryan Ferry and Nick DeVille. Both the girls were fans of the band and neither of them thought it was as scandalous as the United States and a handful of other countries did. Atco Records had the sleeve wrapped up opaque green plastic with a warning sticker. Later, it demanded a redesign with the shrub on the back cover put on front, cutting out the girls all together. A few graphs about the man who made Wolfgang's Vault possible. Whether the art was commissioned by the Fillmore or inspired by it as it took hold, Bill Graham (a.k.a. Wolfgang Grajonca) deserves some of the credit. Had it not been for his vision, there is a good chance that the concert art movement spawned in the 60s and 70s may never have happened. He was among the first to commission artists to promote concerts (much like the Impressionists were commissioned to promote shows) and smart enough to overprint everything, preserving it all for its historic importance. Today, Wolfgang's Vault is filled with both vintage originals and recreations. Sometimes it is almost hard to believe that Graham's presence in the concert scene started shortly after securing a modest three-year lease on the Fillmore Auditorium in San Francisco (1966). Almost overnight, he became the man who would introduce audiences to legendary acts like Otis Redding, Grateful Dead, Janis Joplin, and Jimi Hendrix. After San Francisco, he expanded his productions to New York City. The Fillmores eventually closed in 1971, but both locations had a wild ride with thousands of concerts by an eclectic lineup that included those who were famous and those who are still unknown. Graham stood up for all of them and always demanded audiences give opening acts a fair shot. He continued to do so even after moving on to larger venues. Wolfgang's Vault Collection Of Vintage Ts Screens 7.8 On The Liquid Hip Richter Scale. On any given day, Wolfgang's Vault carries more than vintage T-shirt designs, ranging from the artists that Graham commissioned to those with timeless band logos like the Ramones. With some of the T-shirt designs trending toward simpler art, revisiting some timeless retro designs might be in order. The majority of Wolfgang's Vault comes from comes from the exquisitely preserved, original archives of Bill Graham Presents. Beginning with the seminal concerts of the mid 1960s and continuing through today, the store has assembled a superb collection that is being cared for in state-of-the-art facilities. You can find the various retro apparel designs as fresh as the era when they were introduced.